Welcome to our next giveaway of some coupons from Foster Farms for some free food. Open to US residents only, you have through 3/29 to enter. Good luck. Ready to get your game face on? Be sure to visit Foster Farms Buzzer Beaters today for your chance to play and win! 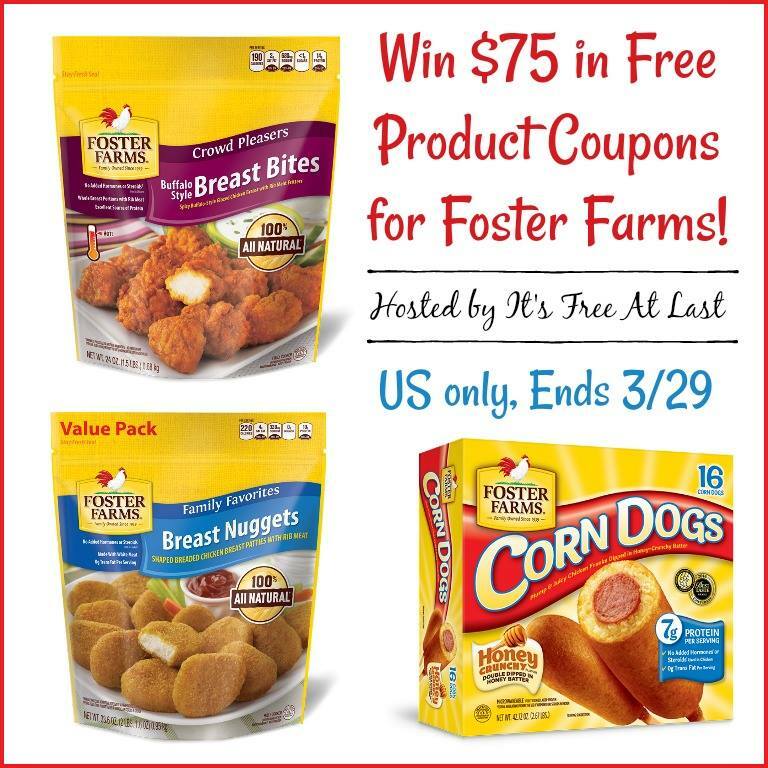 Also, to sweeten the deal, check out below for your chance to fabulous FREEBIE COUPONS for Foster Farms products (which includes $40 in Foster Farms Frozen Cooked Chicken Coupons and $35 in Foster Farms Corn Dog Coupons)! Giveaway ends 03/29/18 at 11:59 pm ET! Open to U.S. residents 18+ and older. a Rafflecopter giveaway Disclosure: My blog is not responsible for product shipment/delivery. This event is in no way administered, sponsored, or endorsed by, or associated with, Facebook and/or Twitter, Google, Pinterest, Instagram or Klout. This disclosure is done in accordance with the Federal Trade Commission 10 CFR, Part 255 Guides Concerning the Use of Endorsements. Entrants must only enter with either one email address, IP address and/or Facebook account, anyone found violating these rules will be disqualified. It is at the sole discretion of the admin of the giveaway if the winner has met the rules or not. I like Foster Farms chicken! My son loves the chicken nuggets! I just love their corndogs. But, I also love their chicken products. We always have the mini corn dogs on hand. My kids love them! We like the Breast Bites in our house. Some of my favorite Foster Farms products are the Parmesan Chicken Meatballs & the Grilled Chicken Breast Strips. My family and I love the corn dogs. Would like to try on my family they like white meat also. My family loves their Crispy Strips.